Not only is this a terrific story and a favorite book of mine, but Crosby’s Opera House and the Great Chicago Fire play an integral role in my novel, “Alteza.” Of particular interest to me, Charles Gounod’s “Faust” was performed twice during its Inaugural Season of 1865, and many seasons thereafter until the magnificent building succumbed to flames on October 8, 1871 — the night of the newly refurbished opera house’s grand re-opening. Please find Excerpt Below: Eugene H. Cropsey, “Crosby’s Opera House: Symbol of Chicago’s Cultural Awakening.” (c) 1999, Associated University Presses, Inc. In the context of Chicago’s economic and cultural climate, social milieu, and the scramble for prominence among the newly rich, Eugene Cropsey presents an illuminating chronicle of the city’s first great cultural awakening, with Crosby’s Opera House as the central focus. It is also the story of Albert and Uranus Crosby, who migrated from Cape Cod to Chicago where, as successful entrepreneurs, they made their fortunes and later sacrificed it all in their efforts to bring a new musical and artistic enlightenment to their adopted city. The Crosbys’ struggle to enhance the cultural climate out on the urban frontier of the 1860s was a turbulent one, vividly brought to life in this book through a gallery of colorful characters, including many of Chicago’s prominent citizens, as well as the numerous impresarios, artists, musicians, and other entertainers who visited or settled in Chicago. For the large number of fortune seekers migrating from the east, Chicago in the mid-nineteenth century presented boundless commercial opportunities. While their cultural life had been left behind, eventual prosperity and the lessening of physical hardships inevitably led to longing for refinement and the restoration of cultural amenities. The musical and artistic life of Chicago had lagged far behind other cities, but by 1865, Chicago’s population contained a substantial coterie of aristocratic elite who yearned for the higher forms of musical entertainment. In response, Uranus Crosby built a magnificent opera house as his gift to the city of Chicago. America’s premier opera troupes, once having consciously avoided Chicago, were now booking extensive seasons at Crosby’s. The response of Chicago’s audiences and critics was so enthusiastic that the country’s most famous impresarios preferred to open the fall season each year in Chicago, rather than in New York, causing a bitter cultural rivalry to play itself out in the leading newspapers of both cities. Uranus Crosby naively envisioned the opera house as solely an artistic venture. But it soon became commercially unavoidable to fill the non-operatic periods with other entertainments. 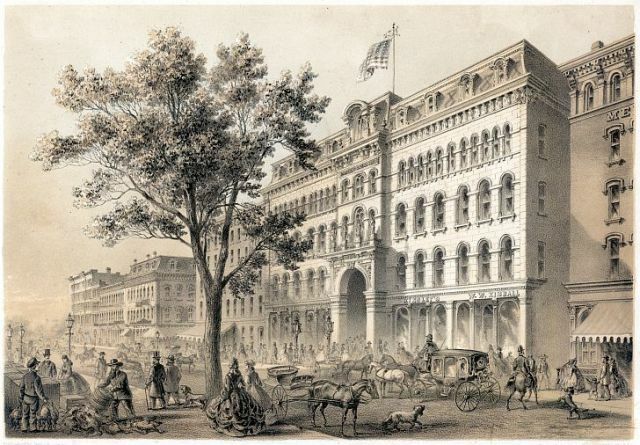 Eventually, however, Uranus Crosby became so overwhelmed by his financial obligations that, in his effort to save the opera house, there followed a series of extraordinary events that threw the city into bitter controversy and drew unprecedented national attention. The Crosbys continued to bring in the country’s best opera troupes. But when the bawdy burlesque arrived from New York as an off-season filler, its outrageous antics brought forth a storm of protest from the press, charging that its performers were prostitutes and that the opera house should now be called Chicago’s “assignation house.” Unrelenting criticism plagued the Crosbys for years until the decision was made to convert the opera house into an office building. Outraged patrons of the opera, however, quickly convinced the Crosbys to keep the opera house and refurbish it over the summer of 1871. 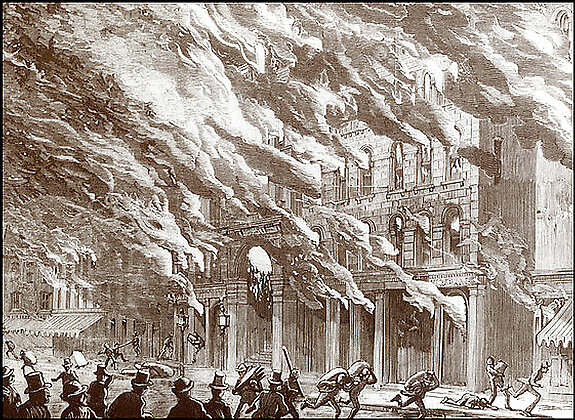 The Great Chicago Fire occurred, however, on the planned re-opening date of 8 October. With the fate of the opera house in the balance and a dramatic rescue, we are given an unforgettable and vivid picture of that tragic day.